Medicinal plants play a vital role to cure various ailments. They are widely used in Ayurveda and are closely associated with human health. They exist in natural forests but their unscientific over exploitation from natural forests, created a threat to their existence in the nature. The only way is meet ever growing demand of medicinal plant6s to grow them at farmers field. The suitable and approachable areas to establish them are farms, garden wastelands, etc. Before cultivating these medicinal plants in these areas, their medicinal and economic values as well as cultivation techniques need to be disseminated to farmers, forest department officials and NGOs so that they can have confidence to grow medicinal plants in their respective areas. Keeping in view, Extension Division of Forest Research Institute (FRI), Dehradun conducted 3 days training from 9th to 11th October, 2018 on “Cultivation and utilization of medicinal plants” for frontline staff of Forest Department, NCT Delhi and farmers at Asola Bhati Wildlife Sanctuary, Tughlakabad, Delhi as an extension activity under Van Vigyan Kendra, Delhi. The training was inaugurated by Mr. S.K. Muan Guite, IFS, Dy. 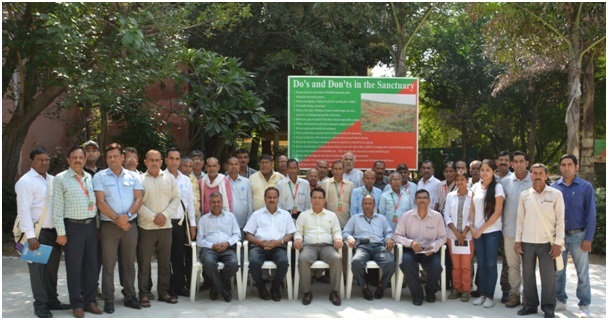 Conservator of Forests, South Forest Division, NCT Delhi. Beside above interactive talks, a local visit to Dr. Karni Shooting Range, Asola Bhati Wildlife Sanctuary, Tughlakabad, Delhi was arranged where participants came to know about different medicinal plants planted in the sanctuary and Butterfly park located in the sanctuary. The training was completed successfully on 11th October, 2018. After completion of training views and feedbacks were taken from participants to evaluate the effectiveness of the training. Certificates were distributed to all participants. The valedictory session was anchored by Dr. Devendra Kumar, Scientist-D.
Dr. Charan Singh, Scientist-E, Dr. Devendra Kumar, Scientist-D, Shri Rambir Singh, Scientist-D, Shri Ajay Gulati, Sr. Technical Officer and other team members contributed a lot in planning and completion of the training under the leadership and guidance of Dr. A. K. Pandey, Head, Extension Division, FRI, Dehradun. Participants appreciated the training programme and hospitality given by the team of Extension Division, FRI, Dehradun.